Looking for best bed bug spray? These little bugs are just the bane of sleepless nights. Waking up to a new set of itchy red rashes is not pleasant, especially when you don’t know where it is coming from. What causes this? … Bed bugs. These uninvited pests have a flat body and an oval stomach. They do not possess wings and thereby rely on humans and animals to transport them around. The bugs are a reddish brown color and their size averages around 5 millimeters. How do the Bed Bugs Bite? Bed bugs have pointy-like mouth parts which can pierce through the skin and dermis to reach the blood vessel. 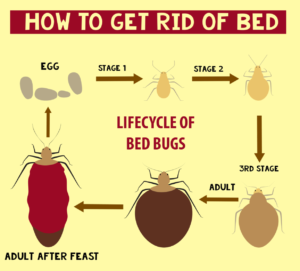 Typically, a bed bug will keep inserting its pincers into the human skin until it finds a blood vessel to feed on. This is also why one may have multiple bed bug bite spots and rashes. Once a bug has fed, it can go days without feeding. Bed Bug bites are itchy once the skin around it becomes swollen and a rash develops. But you cannot feel the bug biting you because they release a local anesthetic into your skin as they bite. This makes your body not notice the pain temporarily. Only when the anesthetic wears off, the sensory cells of your body recognize the itching and pain from the bite. This Bug Spray is essentially an insecticide, but does not contain toxic chemical compounds, and smells like cedar. A total of 96% of the chemical formulation is a mixture of three entirely safe compounds: water, silica hydrate, and glycerol mono oleate. The EcoRaider Spray has micro active ingredients as part of its chemical composition which is specific to invertebrates. These ingredients are set to penetrate the exterior of the bugs. Once inside the bugs, these chemicals will attack the neuron receptors of the bugs, thus killing them effectively. Because these toxic ingredients are bug specific, they are not harmful to humans or other pets. As one of the best bed bug spray, the potency of the spray will last for two weeks at maximum. That is why you will need to spray again once the time is up. Has a non-toxic chemical formula which makes it extremely eco-friendly. 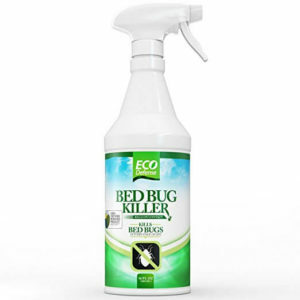 Kills bed bugs fast, and retains protection over an extended period. May not be potent enough for bed bug infestations that are very deep. The smell of the spray might be unbearable if rooms are not well ventilated. First of all, as part of the best bed bug spray list, the EcoDefense contains a mixture of natural and synthetic chemical components despite its claims to be entirely organic. The active ingredients include Sodium Lauryl Sulfate (SLS), and Geranium Oil. These are combined with inactive components of the mixture, which include Distilled Water, Ethyl Lactate, and Citric Acid. SLS is a potent toxin and brings instant death to the bugs. It is a neuro toxin, and thus promises instant kill upon impact. The method of spraying is a fairly simple one. 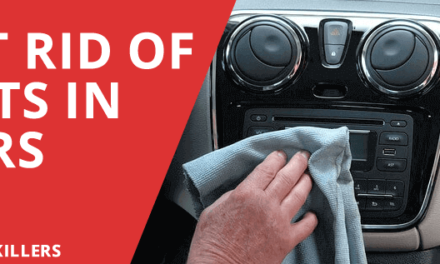 Following the procedure of stripping the room of its clothing items, the product can be sprayed around the room. 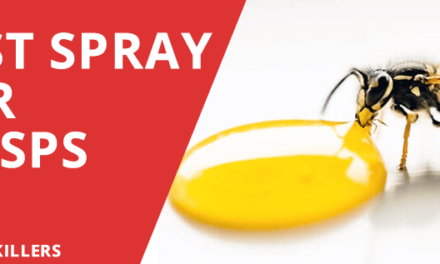 Because SLS is a potent neuro toxin, it is suggested that contact with the sprayed room be kept for a period of 24-48 hours to avoid harmful effects on yourself or your pets. Instantly paralyzes and kills bed bugs. Does not leave stains on your furniture or bedding, etc. The smell might be intolerable for some people. 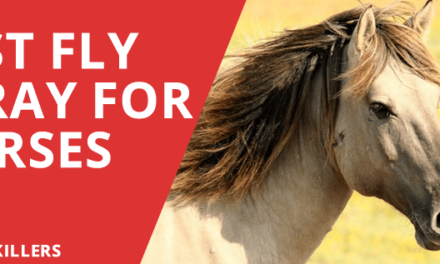 SLS is a powerful toxin, and some people may be reluctant to use it around their residence. This 18 oz spray bottle contains a mixture of these organic compounds: Imidacloprid, Phenoxyethanol, and 2-dimethyl-3-cyclopropane carboxylate. This chemical combination is long lasting and fast acting. And the formula will even work on pyrethroid resistant bed bugs as well as all other types of bugs. The unique formulation of this spray gives it an edge over other sprays. 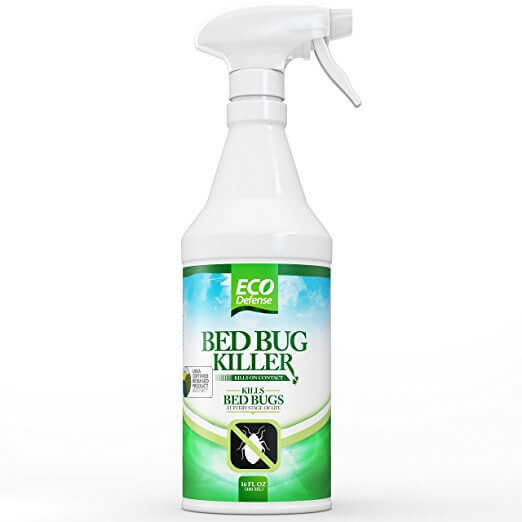 The spray is uniquely qualified to kill even those bed bugs which have become resistant to the regular bed bug formulations. This spray should be used in combination with other prevention techniques for maximum efficacy. Due to the formula being extremely toxic, the spray can continue to work up to 2 weeks after initial spraying. It is best to avoid the sprayed room coming into contact with humans or pets for fear that the formulation may rub onto them. Kills all bugs on impact completely within a few hours. Spray even works on bugs that are resistant to regular bug killing compounds. The compound takes longer to dry and be safe around. The smell might be unbearable for most people. 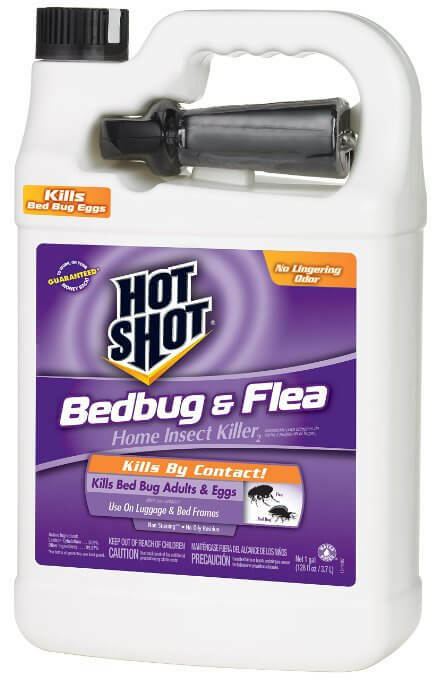 Hot Shot Bed Bug Spray contains these active ingredients: Permethrin and Cypermethrin. Both are variants of chemical compounds already popular in domestic bed bugs. This makes this spray a very potent insecticide for bugs that have developed resistance to common toxic chemicals. Permethrin is a very potent toxin for killing insects. It works on insects and bugs even those which are resistant to the regular use deltamethrin. The 32 oz bottles contain the potent fluid which can be sprayed instantly. It is recommended to strip the room of all clothes, curtains, and linens before spraying, so the insecticide does not lodge into the fabric. The spray works well every after two weeks of being sprayed properly. Contains Permethrin, which works on insecticide-resistant bugs. The standard bottle comes in a 32 oz size, which is economical and can be used for longer periods. Has a predominantly artificial chemical compound makeup. The chemical smell is unbearable as there are no ingredients to mask the odor. The Harris Bed Bug Spray contains deltamethrin. This compound is potent and kills bed bugs, lice and other insects on impact. Other ingredients present are merely inactive ingredients which may or may not supplement the killing process. Follow the precautions and strip the room of its fabric materials. Cover any exposed skin on your body, then proceed to spray the fluid around. The mixture is potent; it instantly gets absorbed through the insect skin and kills the bugs. The formula works for well over 2 weeks, but the fluid can be sprayed per will onto surfaces that face most infestation. The spray comes in a large bottle for a low price, making it an economical choice. Gives instant death to the insects, as can be witnessed during the spraying procedure. The smell may become unbearable without proper ventilation. Bugs may become resistant to deltamethrin if the spray is used excessively. How to use a Bed Bug Spray? Bed Bug Sprays come in an aerosol dispenser and work like any other spray bottle. However, they need to be used in a particular manner if you are to maximize the effect of the contents of the bottle. If the spray penetration is not deep, all bed bugs will not die, and the infestation will continue to be prolonged. Furthermore, once you spray everything completely, close the room for 5-10 minutes, and then open all windows and turn on the fans. The ventilation and air will dry the spray and also get rid of the strong insecticide smell. Do not proceed to use the room right after it has been sprayed. Use a Bed Bug mattress cover to add an extra layer of insulation between yourself and the bugs. Continue to practice the spraying routine in the room for furniture and carpets (if any), to be on the safe side. Bed Bug sprays are meant to kill bed bugs. This means that the sprays are technically pesticides, even though their potency has been reduced. Thereby it is important that you take extra precautions when using these sprays around your house. Particularly when you are handling spray bottles yourself. Cover your body. Use plastic gloves, so that the spray doesn’t get on your hands, not even by accident. Also, use a mask to protect yourself from inhaling the fumes from the spray bottle. Wear old clothes that you can change as soon as you are done spraying, and cover your feet entirely as well. 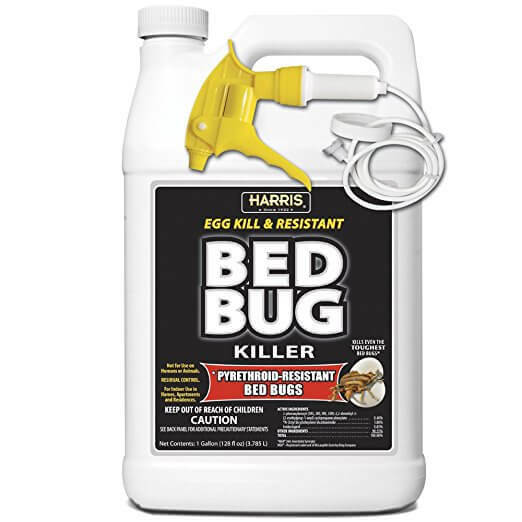 Store your best bed bug spray in a cool, dark place to avoid the loss of spray potency. Also, use a storage location which is inaccessible to your pets and children for safety. Like Roaches, bed bugs are a pest. All of the products reviewed are all designed to kill bed bugs – they all work well to cure bed bug infestations. 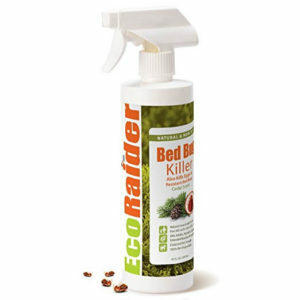 However, the EcoRaider has been voted as the best Bed Bug Spray on the list. This is because it is safe, and has active ingredients which are non-toxic.